Just regular folks. : Wrapping paper. I went a little crazy this Christmas and bought myself a bulk roll of silver wrapping paper. I did not realize it would be very heavy. 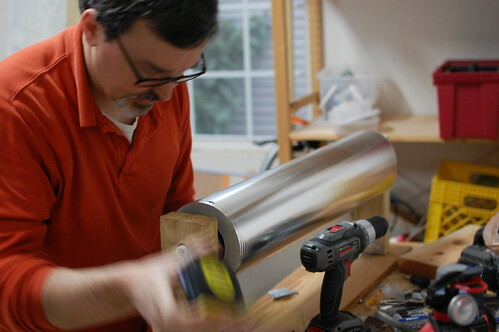 I did not realize that it would be made even heavier by my husband making me a wooden silver wrapping paper dispenser with a scotch tape dispenser screwed into the base (so you never have to go looking for the tape!). I am questioning if this was a wise move because I think I'm saving money per square foot of wrapping paper, but now it no longer fits into any sort of reasonable size storage area. I am hoping to never buy wrapping paper again. That looks like some serious Martha Stewart style paper and device. Hang it on the wall in your gargae above a table like in the gift wrapping dept at the mall. Or put it in the kitchen and tell people it is aluminum foil.